Security is our passion. We have been awarded the coveted A-Rating from the world's leading security and penetration-testing website: Qualys. You've probably never heard of them, because of course it's not your area of expertise, and neither should it be. We've heard of them though, and we take it seriously so you don't have to. There are many aspects that need to be perfect to achieve an A-Rating. The Qualys test is a highly coordinated, comprehensive and deep set of stress tests and hack-attacks using typical hacking methods, to try to penetrate a system. As you can see, we have performed perfectly. End to End Encryption - Everything that you send to us and we send to you or your clients is heavily encrypted and transferred through a private secure tunnel. It is simply not possible to know what is contained inside these 'packets' whilst in transit. Enterprise level secure communication channel for both your clients and internal office to office communications, as a modern alternative to emails. These internal transfers never leave the highly encrypted realms of Cloud Ark, no matter where you are sending to and from. Highly secure data centres. Your data sits on our machines inside data centres that are practically fortresses. It is not possible to gain access to our data centres without multiple levels of security such as gated entry, keycoded cards on every door, 24/7 on-site security personnel, PIN controlled areas, etc. Redundant storage - all your data is backed up multiple times and mirrored across different physical locations. Extremely high levels of encryption applied to your files while in our storage Arks. Even if thieves got hold of your data somehow, it would be a massive nonsensical and impenetrable jumble of characters, and utterly useless to them. Regular Updates - We are constantly updating and improving Cloud Ark. Because the whole system is built in-house, we can react to any emerging real-world situation instantly. 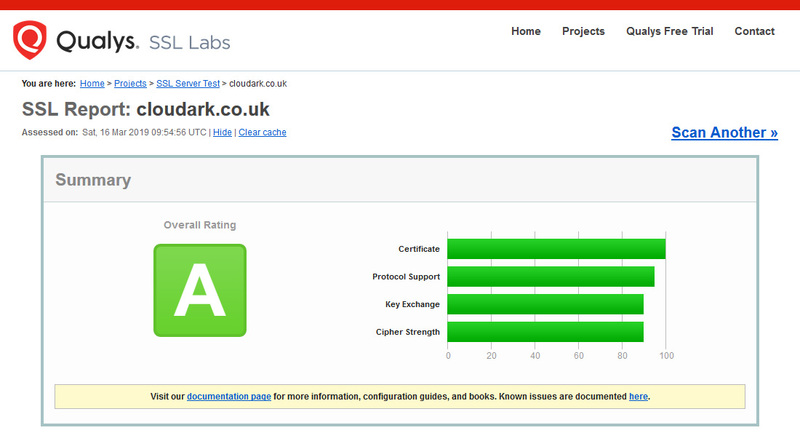 Coverted 'A' rating for security, encryption and defence against hacking. Awarded by QUALYS, the world's leading security testing company.